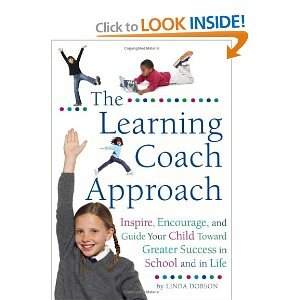 I recently read the book The Learning Coach Approach by Linda Dobson. Since I try to use a self learning approach as much as possible with my children, this book caught my attention. Although this book is not written only for homeschoolers, it can be a great tool that homeschool parents can use. Parents are best suited to help their children enjoy learning. No one knows a child better than their parent. Learning that "sticks" is more important than tests or workbooks. There are tons of ideas and lists in this book that help parents use any moment in the day to help their child learn. Lists of things to watch for in how your child spends their free time. Lots of real life examples of students and parents and what they changed to help their children learn even more and with more interest. If your child is.... gave ideas on how to inspire your type of child. Lots of ideas of ways to incorporate learning while doing normal chores or family activities. How to create a learning environment in your home. Ideas of how to learn from things around the house. Field trip ideas and learning opportunitites in your community. Tons of ideas for learning fun at home. I really enjoyed this book and wish I would have read it years ago. Linda does a great job of explaining how our current system of education is set up and how parents can help their children learn how to enjoy learning and thinking. She helps parents see how they can use their children's own curiosity to help develop interests, attention, and then learning. I've been homeschooling for a long time and I learned quite a few things from reading through this book. One thing I learned was to think out loud. As our children hear us thinking out loud (hopefully realizing that we are not going crazy), it helps them see how we go about solving problems. Many times when I think out loud my children have the answer for me. Even if they don't, it's still a good practice to use since our kids can learn a lot from how we live our lives and all the things we are responsible for. Even though The Learning Coach was written in 2005, it still has tons of relevant information for parents. Even if a child is in public or private school, this book helps parents see how they can help their children learn during the time they are with them and gives them ideas on how to help them learn better in school. Lets face it, if a child is curious and interested in the world around them, any parent, given the right tools, can inspire them to learn, think, and grow.